Adolf Hitler, Hermann Goering, Wilhelm Keitel, and Heinrich Himmler. April 20, 1941. Five years later all the four would be dead, three suicides and a hanging. This is probably the last peaceful moment they had, two months later the invade of Soviet Union would begin. You can almost see the distaste that Himmler had towards Goring here. Goering was the head of the Luftwaffe and in the beginning Hitler’s right hand man. But after the Luftwaffe didn’t do good in the Battle of Britain, Goering fell out of favor with Hitler and was slowly pushed out by Himmler, who replaced him as number two. 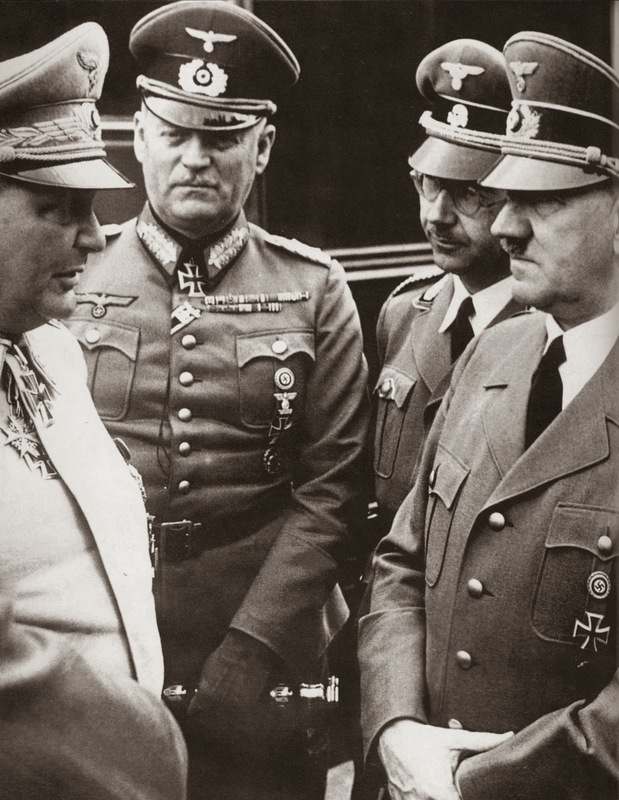 Goering was also a very corrupt man, he used his status to collect bribes, he collected property that was seized from Jews, while Himmler was the real evil driving the Nazis. He orchestrated the Holocaust and was the head of the SS and Gestapo. Hitler and his wife Eva Braun committed suicide. Braun bit into a cyanide capsule and Hitler shot himself. Wilhelm Keitel was tried at the Allied court at Nuremberg, sentenced to death, and hanged as a war criminal. He was the third highest-ranking German officer to be tried at Nuremberg. Heinrich Himmler was captured by the British Army. He was taken to the headquarters of the Second British Army in Lüneburg, where a doctor conducted a medical exam on Himmler. The doctor attempted to examine the inside of Himmler’s mouth, but the prisoner was reluctant to open it and jerked his head away. Himmler then bit into a hidden cyanide pill and collapsed onto the floor. He was dead within fifteen minutes. Hermann Goering was sentenced to death by hanging by the Nuremberg trial. Goering made an appeal asking to be shot as a soldier instead of hanged as a common criminal, but the court refused. Defying the sentence imposed by his captors, he committed suicide with a potassium cyanide capsule the night before he was to be hanged. The MSM (main stream media) has managed to make you believe Hitler committed suicide. The Brits have secret archives that will be revealed only in 2045 which will change the course of history. By 2045 most of the alleged victims would be long dead. There is not one single piece of evidence pointing out that indeed Hitler has died by suicide. Hitler has been known to use doubles. It was his double the soviets found inside the bunker with a hole in his head. The alleged Hitler's skull has been found to be that of a woman. If you think Hitler died in that bunker you're all sheep. Even Stalin himself said Hitler didn't die. Nobody can prove anything. Those archives that have been kept secret since 1945 will be open to the public in 100 years after WW2. Hitler most likely lived long after the war's end and died in Argentina. He could have been a puppet. If it wasn't for him the state of israel wouldn't exist. The americans build the nuclear bomb with hitler's scientists who got their knowledge from a crashed UFO in nazi germany. You're full of tinfoil hat conspiracy theories, aren't you? No, You Andrew, are wrong. Hitler was sick , suffering since the early 1941s from Parkinson illness. He needed many many medicaments every day. The risk to be discovered on the way to freedom and finishing finally like Mussolini hanged open air, head below, was far to high. No, Adolf committed suicide on this day of grace Monday, 30th April 1945, at approx. 15:30 h , one day before his esteemed follower, limp-leg, Göbbels with wife and murdering by poisoning their 6 most pitiable children. // By the way, Opening the documents by 2045 only ? I have also read dates of year 2017 and 2029, anyway, Pls note that incriminating documents were already eliminated by burning at the end of the war so that the humanity must not expect anything interesting by opening, finally, the archives that late. > Enlightened mankind knows also by now that neither Churchill nor Roosevelts were saints. The first missed, not without reasons, his reelection still in 1945 and the second died, strange to say, the same month as AH. What a remarkable coincidence ! "But after the Luftwaffe didn’t do good in the Battle of Britain". What part of this sentence is grammatically not good? Regarding the final fate of Goering by suicide instead of being hanged, > due to unprofessionally lax, not enough reflected organisation of emprisonment procedures > since all prisoners had all the time the same guard, so the one of Goering had some platonic relationship to his wife who gave him the poison pill which he added in a hidden way to the food of the prominent prisoner enabling this one to commit suicide one hour earlier, approx. at 23:00 h yet on October 15, while his 10 fellow criminels of war were hanged in the first hours of memorable day of grace, Wednesday, October 16, 1946. To add is that I would have preferred this lawsuit to be held under Russian rule so that more criminel nazi galllows-birds would have been hanged, especially Hitler's architect SPEER, ((already set free in 1966 ( + 1981 in London)) // Unfortunately, death penalty was abolished in Europe on and after the 1980s so that the good day of 16.10.1946 is never since recalled in memory in our system-directed-mass medias of imposed public opinion // Thus, hoping on better times to come in this respect in a few decades ! !